Do you know the difference between a sweet potato and a yam? Me neither. I did some research, and despite my view of myself as a relatively intelligent person, I keep confusing myself more on this issue. If you'd like to attempt reading an explanation, I'll hand it over to the Library of Congress. Even better, if you know the difference and want to explain it to me in an idiot-proof way, I would be much obliged! This dumpling recipe called for sweet potatoes, so after a small grocery store panic attack, I bought the ones with the sign that said "sweet potatoes". They were the really light ones with light brown skin and yellowish flesh, not the dark orangey kind. For the record. This was my 3rd time making gnocchi from scratch-- I've made potato and ricotta before-- and the third time was (*cliche alert*) definitely the charm here. Although time-consuming (save it for a weekend or special occasion), the gnocchi was pure heaven in a bowl. The addition of the green apple was a genius idea, and although there were a lot of flavors to contend with, everything came together brilliantly. For another point of view and some gorgeous photos, take a look at Anne's version of the same dish. P.S. A big heartfelt thanks to everyone who took the time to comment on my last post about a recipe difficulty rating system. My decision for now is to hold off. It would be a lot of work, and there seemed to be quite a few mixed opinions. However! I am planning a big site overhaul (transferring to Wordpress) over the course of the next 6 months (I'm graduating and will have more time to play! ), and will most definitely revisit the ratings, and a time gauge, at some point during that process. 1. Preheat oven to 350 degrees. Pierce the skin of the sweet potatoes with a fork and place on a foil-lined baking sheet. Bake until tender, about 40 minutes. Allow to cool until comfortable to touch. Peel and pass through a ricer into a large bowl. Combine sweet potato puree, flour, sage, salt and pepper. 2. Turn dough out onto floured surface; divide into 6 equal pieces. Rolling between palms and floured work surface, form each piece into 20-inch-long rope (about 1 inch in diameter), sprinkling with flour as needed if sticky. Cut each rope into 20 pieces. Roll each piece over tines of fork to indent. Transfer to baking sheet. 4. Preheat oven to 300°F. To make the sauce, melt butter in heavy large saucepan over medium-high heat. Cook until butter solids are brown and have toasty aroma, swirling pan occasionally, about 5 minutes. 5. Add chopped sage (mixture will bubble up). Turn off heat. Season sage butter generously with salt and pepper. 6. Transfer half of sage butter to large skillet set over medium-high heat. Add half of gnocchi. Sauté until gnocchi are heated through, about 6 minutes. Empty skillet into an ovenproof bowl; place in oven to keep warm. Repeat with remaining sage butter and gnocchi. 7. Divide gnocchi and sauce among shallow bowls. Sprinkle with grated parmesan and grated apple and serve immediately. Ohhh this looks amazing!! Added to my "to make" list! 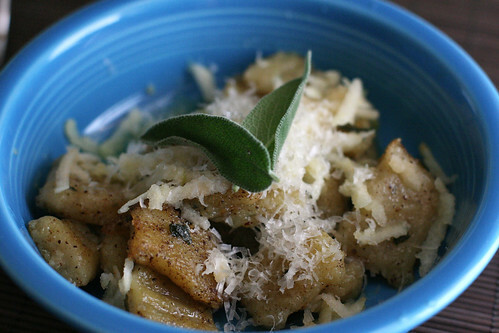 confession: i'm a gnocchi-making virgin. i like the looks of this batch, though, regardless of the fact that the whole sweet potato-yam conundrum continues to baffle me. nice work! I was unaware a sweet potato/yam distinction existed until a year or so ago. I had never even eaten what I understand to be referred to as a sweet potato, and had been calling yams sweet potatoes all my life. Talk about earth-shaking realizations. Either way, I have recently been looking to make something out of one of them. We ate a lot of gnocchi with pesto this summer and seeing this, I can't believe I never thought to use sweet potatoes in the dough--probably not to pair with pesto, though. Thanks for the linky love! :) I think what I used might actually have been yams, but frankly I'm not entirely sure what the difference is (since apparently there are also orange sweet potatoes). Hrm. This looks great! I've always been afraid to attemp gnocchi because of all the 'Top Chef's' getting slammed for making them wrong. hahaa! This looks soooo good! I love sweet potato and anything pasta so this is going on the must cook list!! Isn't sage lovely? This looks super yummy.